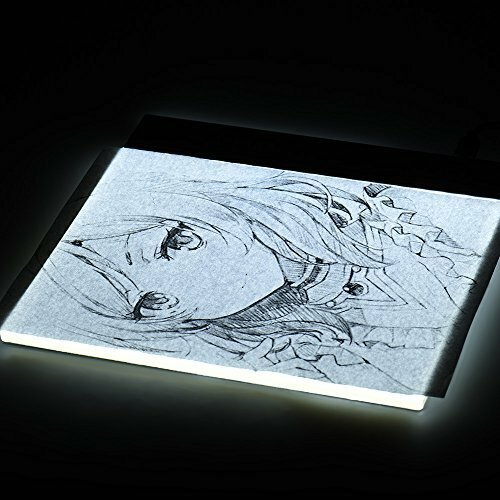 Mini and Portable: A5 size LED light box for drawing, tracing, stenciling, sketching, etc. Flexible for you to a optimum light by the stepless brightness control, even light for eye-protecting. Ultra-bright can light ≤300g watercolor paper, such as for Canson, Kent paper, non-woven fabric. Reliable material with compact structure, not easy to deform. High transparent acrylic panel with great toughness & durability. 5mm of thickness, available area approx. 19 * 15cm / 7.5 * 5.9in. You can easily put it under your coloring book rather than tear the paper off. Micro USB interface for power supply, comes with a USB cable but the adapter is not included. Please remove the protective cover before use it. We just supply you with a USB cable, you can powered with the universal phone adapter, power bank or computer USB interface. The package does not including the power bank and power adapter. If the light is flicking after powered on, it is normal situation may caused by the input doesn't match the product. You can solve the problem by changing the charger, charging treasure or computer interface. The Stepless Brightness Control:Flexible for you to a optimum light by the stepless brightness control, even light for eye-protecting.Ultra-bright can light ≤300g watercolor paper, such as for Canson, Kent paper, non-woven fabric. Ultra Thin：5mm of thickness, available area approx19 * 15cm / 7.5 * 5.9in. You can easily put it under your coloring book rather than tear the paper off. High Transparent Acrylic Panel:Reliable material with compact structure, not easy to deform. High transparent acrylic panel with great toughness & durability. Easy To Use:Micro USB interface for power supply, insert the plug & turn it on, then you can start your creative work. If you have any questions about this product by Aibecy, contact us by completing and submitting the form below. If you are looking for a specif part number, please include it with your message.